Ready. Set. Choose your commercial floor colors! Wait, not so fast! Prior to selecting a certain floor color for your Tampa business, it’s essential that you go through the material selection process. This is the only way to get the right flooring solution for your commercial environment. According to our technical experts, epoxy coatings are some of the best commercial flooring solutions available nowadays. The reason is that these coatings are easy and fast to install, and last much longer than other flooring alternatives. However, every type of epoxy coating performs well under specific conditions and environments. When searching for epoxy systems for commercial spaces, you’ll find the following categories. Self-leveling epoxy systems – These flooring solutions deliver a perfectly flat and smooth surface finish, with low maintenance and high gloss levels. Suitable for installation on top of new and old concrete floors, self-leveling epoxy is generally used in commercial applications where tight levelness and flatness tolerances are specified. Self-dispersing coatings – Self-dispersing epoxy formulations are some of the best commercial flooring solutions for heavily trafficked areas, including areas of forklift operations. 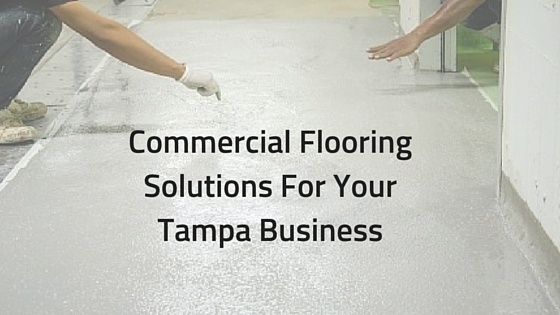 Depending on your Tampa business activities, you can also opt for self-dispersing epoxy coatings with quartz sand. Having excellent anti-slip characteristics, these coatings can reduce the risk of slips and falls, specifically in areas subject to accidental spills. Graveled and terrazzo epoxies – These two commercial flooring solutions are our top recommendations for spaces that can benefit from a touch of sophistication, such as retail stores, offices, education and cultural buildings. You can use graveled or terrazzo epoxy coatings to add custom logo design or beautiful decorative details to your floors and set your Tampa business apart from all the others. High-solids epoxy coatings – Especially designed for the most demanding commercial environments, high-solid epoxies create a strong, durable bond with the substrate, delivering a solid, impenetrable coating that can withstand many years of abuse. One of the greatest advantages of choosing a high-solids coating formulation over other commercial flooring solutions is that it requires fewer coats to achieve the desired thickness. This translates into reduced time for coating application and fewer chances for inter-coat adhesion problems. Rapid drying time resulting in quick project turnarounds and minimal downtime is another advantage that has serious appeal for a business owner looking for commercial flooring solutions. Water-based epoxies – Water-based epoxy formulations aren’t as durable as other alternatives. However, these products offer the distinct advantage of minimal surface preparation prior to recoating, as opposed to other coatings that require a thorough preparation of substrates. Clear epoxy topcoats – Typically used as finishing flooring solutions, clear topcoats make your floor easier to maintain and better looking, allowing you to brighten or soften your entire facility, and increase your floor’s longevity by improving its resistance to mechanical and chemical stresses. Before choosing among the aforementioned commercial flooring solutions for your Tampa business, several things you may want to consider are the abrasion and impact resistance, thermal expansion coefficient, anti-slip properties, reflectivity, appearance and maintenance. At Performance Painting Contractors, we offer professional epoxy coating application and installation services for residential, commercial and industrial facilities located in Tampa, Jacksonville, FL, and neighboring areas. Once dried, the epoxy coatings we install over new or old concrete floors turn into hard-wearing, durable, waterproof, appealing and easy-to-maintain surfaces, just perfect for a wide variety of activities. To learn more about how we can help you transform your lifeless business into an eye-catching, marvelous and inviting commercial space, call (813)-308-0388 or (904)-641-4800 today to get in touch with our flooring experts in Tampa or Jacksonville, FL.